This is a book that, fittingly perhaps, I am reading because I discovered it in the library. The library at American University, that is. Not the Library of Babel. Although this book could, conceivably, be discovered in the Library of Babel. I wouldn’t give much for your chances of finding it, but it’s possible. The central challenge Jorge Luis Borges poses to any writer is that he has, at least on a meta level, surpassed and completed us. Any story we can ever write has already been written about by him. 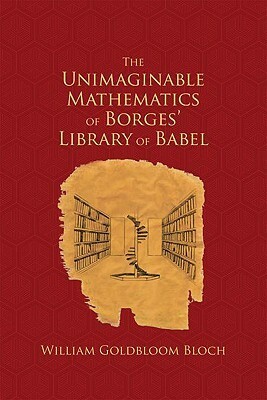 Every conceivable combination of letters, punctuation, and spaces is contained in one of the 410-page volumes that fill his Library of Babel. As I struggle to revise the second draft of One Hundred Days, I take comfort in the fact that the final version could be found somewhere amid those shelves. That is to say, it is logically possible, therefore it should be only a matter of work and dedication for me to bring it into existence. But then, there on those shelves, librarians could also find a of it abandoned…the opening chapter, with every page thereafter filled with empty lines…or the eye-gougingly horrible first draft, or perhaps worse, the perfect Form of my novel, each word perfect and vivid and pure, in sentences I could not string though I tried a thousand million years. There are versions of my works out there written in a far better way than I could ever write them. And there are all the stories I want to write but can never find the time to (there are also, and this is only somewhat a separate issue, the concluding volumes of Frank Herbert’s Dune series but written by Herbert himself as he would have wanted them written. And the Wheel of Time as finished by Robert Jordan. And the novelizations and scripts of the Doctor Who series that ran through the 1990s.) Short stories may exist in collections or on their own, twenty seven pages of text surrounded by emptiness (actually, logically, there are hundreds if not thousands of copies of these, with the spacing of each differing just slightly), or may be continued in multiple largely-empty 410 page volumes. Any work of more than 410 pages would of course come in those separate volumes, which delights connoisseurs of the 18th century. Think of a story, and essay, and expose, a religious text. It’s there. It’s all there. The part where this poses a challenge to the writer is that, if we aren’t careful when thinking of this, we’ll realize that all our work is really just a matter of sorting the same few shapes onto sheets of paper. Nothing a relatively simple algorithm couldn’t do, given world enough and time. 25 to the power of 1,312,000. All well and good, right? But how big is that? With some more mathematical jiggery-pokery that would have had him burned at the stake in earlier, more cautious ages, Bloch demonstrates that the known universe of 10^27 cubic meters could only hold, if it consisted of nothing but 410-page books, about 10^84 of them. I’ll leave it to people with calculators handy to figure out how many times the known universe would fit onto the Library of Babel’s shelves, then. And that’s only part of chapter one! In short, if you have the slightest interest in mathematics, Borges, or glimpsing infinity, I’d suggest you track this one down through a library system at once. I don’t think there’s another book like it in the world. It’s such a select taste that I can’t in good conscience run about accosting strangers and shouting “BUY IT! !”, but it would look excellent on a shelf in your office, den, or waiting room.